Hello wine lovers and happy wine Wednesday! I hope you are keeping well and getting into the summer swing now that it is officially here! I am, once again, up in Penticton for the B.C. VQA panels. My co-panelists are an interesting and dynamic group who all share a passion for B.C. 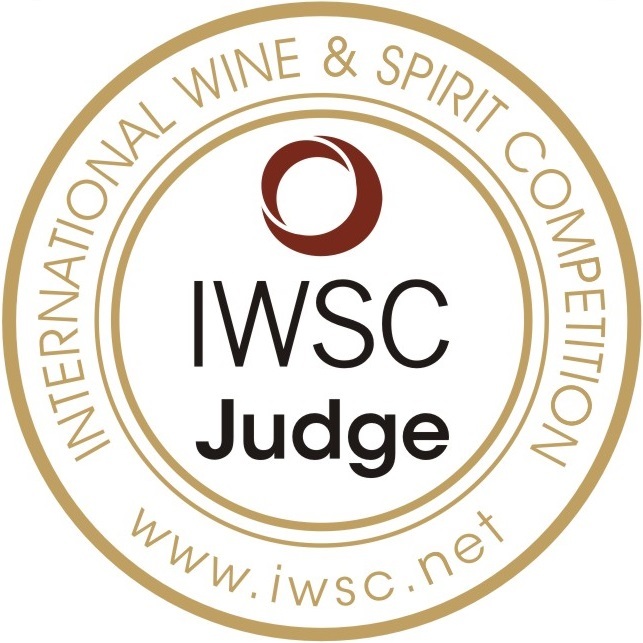 wine and maintaining standards…’Go team!’. Onto the wine of the week and I could not have chosen a better summer wine if I tried! I chose this with the help of the lovely Paula Tutt-Hilliard of ‘Edgemont Village Wines‘ in North Vancouver. We had a great chat about the style differences and I said that I wanted something dry, crisp, refreshing without a lot of residual sugar. Paula picked this great bottle for me and I am most thankful. Church & State have two growing regions – Oliver, B.C. and Victoria (Brentwood Bay), B.C. 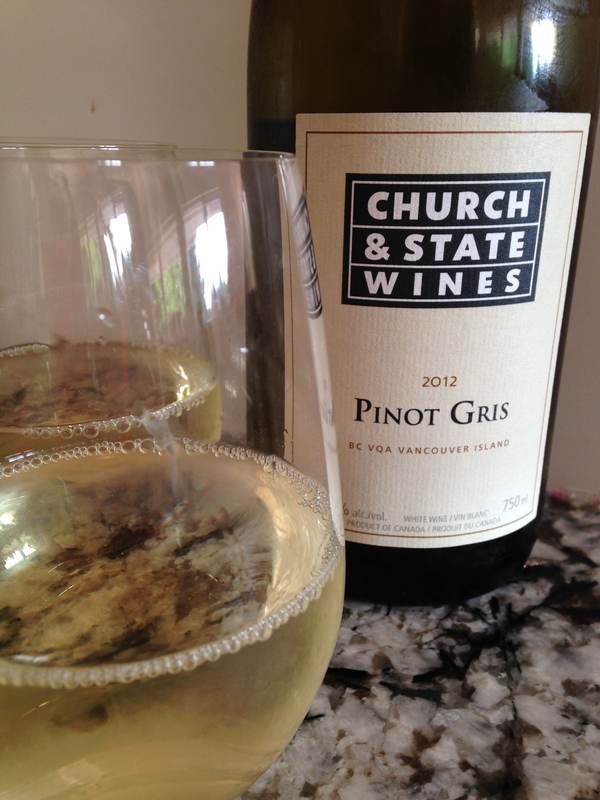 The Pinot Gris from the 2012 bottle is 100% made from Vancouver Island grown grapes and I say cheers to that! At 12.5% ABV, this Pinot Gris is the perfect summer wine. In the glass, Church & State’s Pinot Gris is pale lemon in colour with aromas of lemon zest, red grapefruit and a hint of lime with some minerality. On the palate, it is dry (yay!) with medium plus acidity and medium minus body. The flavour profile is alive with all the citrus fruits yet is balanced beautifully with a clay minerality to give a nice amount of complexity and mouthfeel with a nice finish. Houston, we have a winner! Go treat yourself to this refreshing and lively bottle of B.C. Pinot Gris from Church & State. It retails for $20, so it won’t break the bank and is worth every penny! Pair it with sunshine, great friends and a nice green salad topped with a chicken breast and a squeeze of fresh lemon juice and you will be happy. This is a GGG ‘Hell Yes’ and I am looking forward to more of this as the summer unfolds. That is it for me for this week. Please do email me if you have a wine you would like me to review. As always, I value your feedback and your support. Hi Christine, we are heading up to Osoyoos on Friday until july 9th . I first was introduced to Church & State three years ago, my favorites for the summer are the Chardonnay and Viognier…absolutely FANTASTIC!!!!! Their reds are just STUNNING! Check out also this FABULOUS winery…Mayer Family Vineyards, these guys and Church & State produce some of the best BC white wines, and have some top red contenders, too. Fabulous. your writing ‘chops’ are getting so well honed. Wow. You are asking a lot -Brentwood Bay wines ? What is next? Lovely wine made from that virgin growth area of Grouse Mountain? I just looked for this at liquor store and a specialty vqa store. He said they dont send their island stuff to vancouver. Can you fund out if it is here and wher i might find it? Hi Deb. I found it at Edgemont Village Wines which is a VQA store. It was not at the BC Liquor Store although it may be at the Specialty BC Liquor Stores…I will look into this. Thank you for the feedback.